"I have lost approx. 2 stone, and a lot of inches. I am so pleased, and proud, of what I have achieved, and I celebrated completing the 3months by buying a size 8 skirt and a size small dress!! I always thought 'I've had two kids, I'll never have a flat tummy again' - well, I've proved myself wrong, and couldn't be happier." So my official sustain journey comes to an end on the completion of 3 months, but I will definitely be continuing with the principles as I have genuinely loved it. Not only has my figure changed, but we eat better food, I enjoy cooking, I feel I can teach my children about what food is good food, I’m more confident, and my energy levels are through the roof! I started sustain because I weighed myself at the start of September and was 11st, I had always thought my figure was ok and that I was 10st. I was definitely ready to make a change, I was drinking too regularly (and I’m not good at stopping!) finding it too easy to have crisps etc thinking ‘I’ll get healthy tomorrow’. One of the key things I have enjoyed is that it is something for me, as a part-time working mum of two a lot of my life is about others, and this was entirely for my benefit and I was in control of it. I haven’t had perfect 10s throughout, but on the days where I dropped have been planned, and usually (in fact I think everytime!) been booze related…which then leads to a few crisps…which then leads to cheese and biscuits. I’m not too bothered about sweet stuff, but savoury is my downfall! Being a competitive person, I have liked to get 10s though! I had a few scales issues at the start, but I have lost approx. 2 stone, and a lot of inches. I am so pleased, and proud, of what I have achieved, and I celebrated completing the 3months by buying a size 8 skirt and a size small dress!! I always thought ‘I’ve had two kids, I’ll never have a flat tummy again’ – well, I’ve proved myself wrong, and couldn’t be happier. I have been a reluctant exerciser…in fact I am only just on week 3 of the gym intro, so for most of my journey it’s been about the food with the (very) occasional HIT. I am now enjoying the the gym and look forward to seeing how following the exercise plan will tone my body. 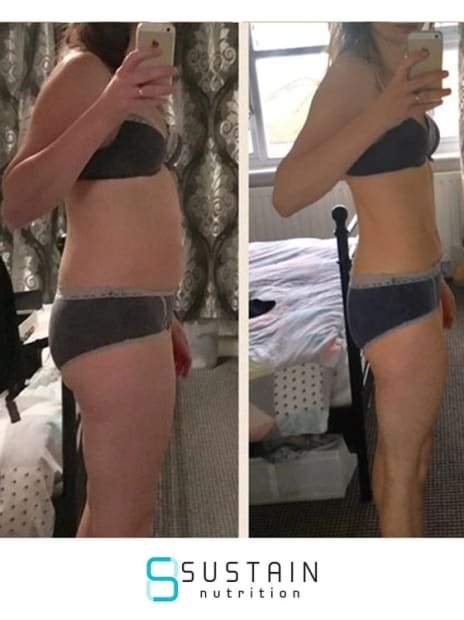 My advice would definitely be to take photos, but also measure everywhere – I only did my waist and hips, but first noticed inch loss on my thighs (random!) but because I hadn’t measured them I don’t know what the loss is. So do hips, waist (belly button), thinnest part of waist, thighs, arms, ribs and chest. A massive thank you to Joe – such a boost to get emails with ‘awesome day 10/10’, and well done to him for managing to read through my predictive text mistakes! Also, thanks to this group, where I have got so many recipe ideas from. Keep going everyone – it is SO worth it!